Horns complete first perfect home regular season. Adams, Berg also score goals in 4-0 victory. UT will visit Texas Tech on Thursday. 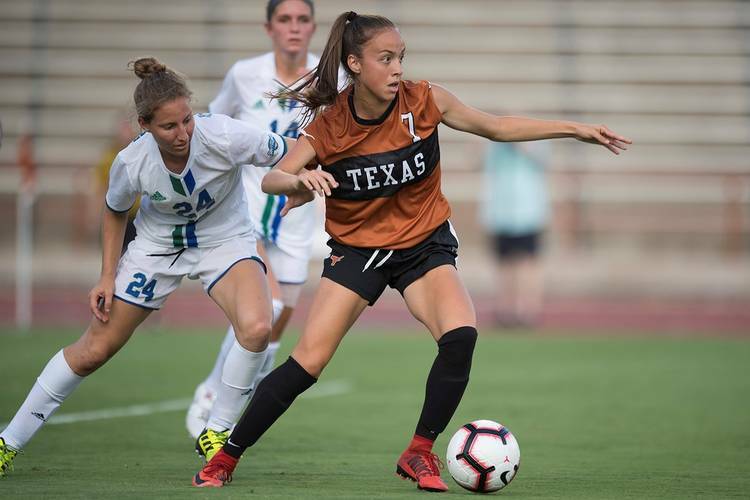 Freshman midfielder Julia Grosso had two of the Texas soccer team’s three second-half goals as the Longhorns rolled past Kansas State 4-0 Sunday in a Big 12 match at Myers Stadium. The goals were the first of Grosso’s career and helped 17th-ranked Texas (13-2-2, 5-2-1) wrap up the first perfect regular-season home record in the program’s 25-year history. The Longhorns have won 11 in a row at home, beginning in the first round of last season’s NCAA Tournament. Senior forward Alexa Adams got UT on the board with an assist from junior forward Cyera Hintzen 35 minutes, 17 seconds into the match. Grosso added goals at 67:58 and 74:02. Sophomore midfielder Haley Berg completed the scoring against the Wildcats (4-11-2, 0-8) at 83:21, assisted by junior defender Atu Mshana. The goals were the sixth of the season for Adams and Berg. Junior goalkeeper Nicole Curry had three saves as she recorded her 16th career shutout and fifth this season. Next up for Texas is a trip to Lubbock to play Texas Tech at 7 p.m. Thursday in the regular-season finale.